In 2011, a labor of love began – saving the precious Botner collection of fruit varieties. Each year since, scions have been collected and new trees grafted. TOC is eternally grateful for the time and commitment of dozens of Home Orchard Society volunteers who have assisted year after year in collecting scions, grafting the apple trees, hauling pots, shoveling soil, and potting and gooping the baby trees. The work required miles of driving, many cold and rainy days outside, some beautiful sunny ones too, hours grafting and potting, many backaches, a few cut fingers, and lots and lots of coffee, food and fun. 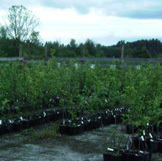 Each evening after the grafted trees were in pots and the room was swept clean, the baby trees were transported to the Home Orchard Society Arboretum on the Clackamas Community College campus. The HOS Arboretum Manager, Tonia Lordy, looked after our baby trees, watering them and keeping them happy. Now that TOC has a home, Almaty Farm, temporary housing for the trees is no longer necessary. TOC has been fortunate to have the commitment of dozens of HOS volunteers. They have assisted us weed, stake, tie and plant the baby apple trees. The drip tape irrigation system was installed in the Dunlap Block for the baby trees. It is full to the fence lines with thriving heirloom apples. We are often as tired as Zabbie looks at the end of a long hard work day. One of our volunteers is Zabergau Reinette, we call her Zabbie for short. Zabbie is a Wipador from Mexico. We first thought she was a Labrador mix, but did not imagine that the “mix” would be Whippet. In the summer of 2015, a friend of TOC, Gina Smith, brought Zabbie home to Almaty after a fun week with friends in Mexico. Zabbie loves to run and play catch with herself, and to find ways out of the fences to be with her people. Zabbie thinks baby trees are toys, loves uncovering rabbit nests, digging for gophers and is curious about the deer. Most of all, she is young and drives Katie, the Dog–Matriarch of Almaty, crazy. 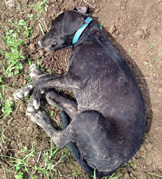 Zabbie has found her forever home in Washington with Steve and Donna, where she eagerly helps Steve in the orchard. Our heartfelt thanks go out to Jerry S, Karen T, Mark B, James B, Nick R, George B, Jodi G, Linda B, Joseph P, John E, Karen P, Nick K, Scott M, Nick O, Ross C, Dennis S, Carolyn and Glenn B, Dan V, Chris H, Jeff J, Mai and Phil S, Patricia T, Bobbie K, Sherry S, Bill C, April N, Olinka M, Jim G, Valere L, Carol B, Tonia L and Clackamas Community College. Please forgive us if we failed to mention your name. We have had many helping hands over the years and appreciate you just as much as those noted here. 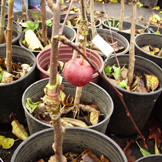 If you would like to learn more about the Home Orchard Society, please visit their website.